ESXi and ESXi free are both versions of VMWare’s baremetal Hypervisor that lets you run an enterprise class virtual infrastructure. 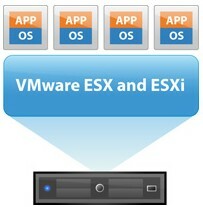 There is a big difference between ESXi and ESXi free, ESXi is the licensed version. The download for both of the free and licensed version is the same. Once you have downloaded the ESXi version, you would be sent a license key and depending upon the free or bought license, your features will be available to you. ESXi is a “thin” version of ESXi. When you download and run ESXi server install, you would get a notice saying you have only 60 days remaining in your trial, although you downloaded ESXi which you thought was free. Althoughy free and limited, there are still lots of advantages of ESXi free, we will discuss this in our article. Step 1: There is only one download for both ESXi and ESXi free edition. Before you download, even for the free edition, you have to do a free one time registration on VMWare’s site, when you opt for the free license, the license keys are emailed to you. Step 2: The next step is to download the ISO image for ESXi from VMWare’s website. Just follow the defaults and make note of the IP address of your baremetal Hypervisor server. Step 3: From another machine connect to the web server IP of VMWare ESXi baremetal server. Here you will find a download link to the VMWare vSphere Client. Run the client from your Windows machine and now this is where you can configure your ESXi server from. When you run the client for the first time, you will get a message about you have about 60 days left in your ESXi evaluation. After installing ESXi, if you look under the features area, you would find that each and every feature is available that includes centralized management using vSphere for all your ESX servers, hot adding CPU and NICs to your virtual machines as well as hot adding / removing storage from your virtual machines, thin provisioning and over commiting memory, HA, etc. However, as soon as you put in the license key you were sent for the ESXi free edition, most of these features disappear. You can no longer manage ESXi free with vSphere centrally, which essentially means that you will have to run VMWare vSphere client seperately to manage each and every ESXi server you have. Also, for both ESXi editions, there is no remote access (such as from SSH) and certain SNMP reporting functions are also disabled. Even with the limitations, ESXi free is still very good for SMBs because it gives them a step in to the virtualization infrastructure. ESXi free edition offers the best consolidation ratio for the virtual machines (meaning you can run most virtual machines possible in the given virtual environment). ESXi 4.0 lets you run both 32 bit and 64 bit virtul machines, but it needs a 64 bit machine to run on. However, if you wanted to run VMWare ESXi free baremetal hypervisor on a 32 bit machine, you can try VMWare ESXi free 3.5 edition. Although, there is no support that comes with VMWare ESXi free edition, but if in need you can always “purchase” support from VMWare for the free edition. When you are ready to convert and avail the full functionality of VMWare vSphere server you can upgrade directly to it from VMWare ESXi free edition. The features in VMWare ESXi free edition give IT administrators a great oppurtunity to try out and step into a Virtualization Infrastructure for Small and Medium Sized business without spending anything extra. It is a win win situation with ESXi free edition!